President Obama has vowed to cut US oil imports by one third, in a speech about U.S. energy security at Georgetown University, Washington on Wednesday. “Even if we drilled every drop of oil of every single one of the reserves that we possess, offshore and onshore, it still wouldn’t be enough to meet our long-term needs. We consume about 25% of the world’s oil. We only have 2% of the reserves. Republicans in the Senate maintain that the Obama Administration is to blame for rising gas prices, and have accused it of blocking domestic offshore drilling. President Obama revisited promises to continue and expand offshore drilling and build more nuclear power plants. He stressed there would be increased safeguards, after the BP oil spill disaster, and the nuclear crisis in Japan following the devastating earthquake and tsunami. 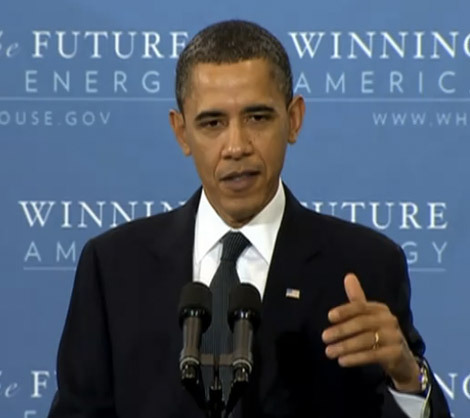 Obama called for increased development in the natural gas and biofuel industries. He has also set goals for having more electric cars on U.S. roads and raising fuel efficiency standards. However, Republican proposals ready to be voted on in the Senate would block the Obama Administration from achieving higher fuel emissions standards. In addition, Republicans want to go as far as blocking the ability of the Environmental Protection Agency to introduce measures to reduce greenhouse gas emissions. Do you think Obama’s goal is achievable?